With Thanksgiving coming quickly, I started working on my menu this past week. One thing I always try to do is have a few snacks for when my guests first arrive so no one is starving and anxiously awaiting our Thanksgiving feast. I also like to have a few similar items for the next day to easily feed any guests that may stay overnight. 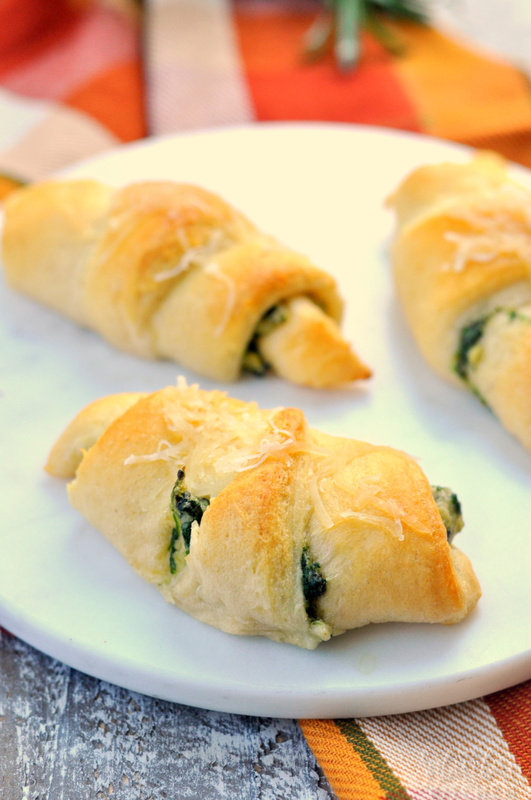 A super easy option for this are spinach artichoke crescent rolls. One of the great things about this recipe is how versatile it is. 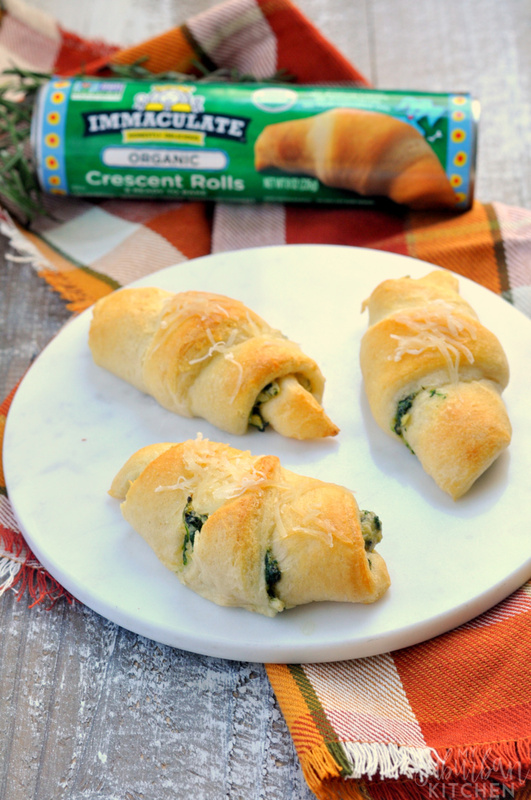 I start with delicious spinach artichoke dip (which easily doubles as second appetizer option) and then wrap it up in yummy organic crescent rolls from Immaculate Baking Co. Immaculate Baking Company’s mission is to create wholesome baking products – many of which are certified gluten-free or organic, that taste great. I always make two batches of these because they disappear so quickly. You can fold them or roll them into the traditional shape…both will still taste delicious. 1. Squeeze out excess moisture from spinach. Add to bowl with Parmesan cheese, artichoke hearts and garlic. Stir well. 2. In a large bowl, beat cream cheese until smooth. Stir in sour cream, Greek yogurt and mayonnaise. Add spinach mixture and mix well. 3. Preheat oven to 375 degrees (reduce to 350 degrees if using nonstick or dark baking pans). Unroll crescent rolls onto baking sheet. 4. 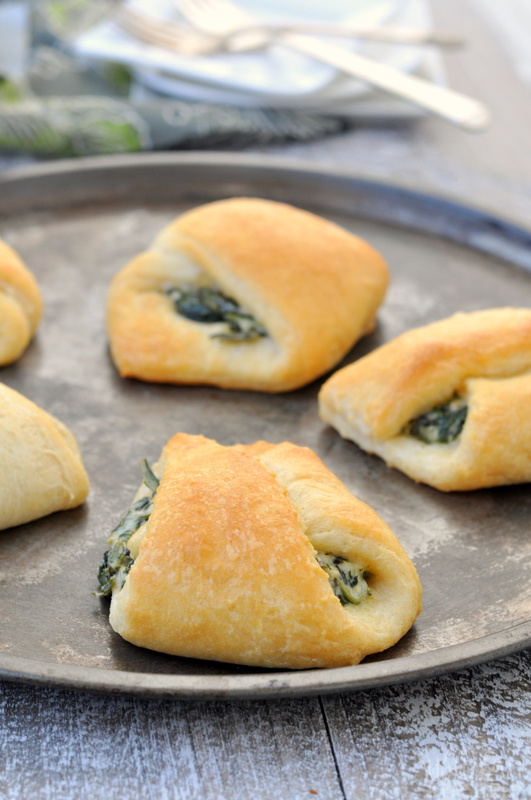 Spoon 1-2 Tbsp of spinach artichoke mixture onto crescent roll and then roll from largest end to smallest. Repeat with all of the pieces of dough. 5. Bake in preheated oven for 10 minutes or until lightly browned. Enjoy while warm. As I mentioned, I have both rolled these and formed them into more square like pieces as well. Either one tastes great and it doesn’t change the cooking time. 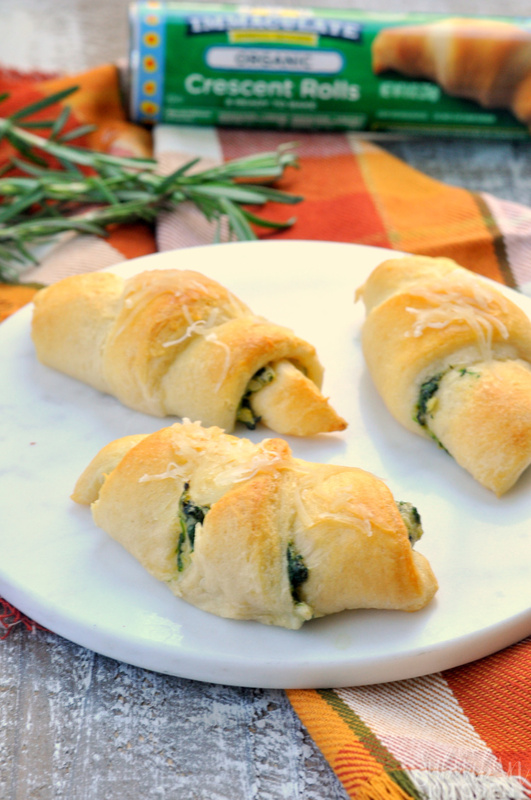 These spinach artichoke crescent rolls are the perfect snack or appetizer as you prep for Thanksgiving or even as part of your overall meal. Just be sure to start with Immaculate Baking Co. Organic Crescent Rolls. And, you can save $1 off any Immaculate Baking Co. product with this coupon. Thanks for this recipe! And I like your idea of having them ready for guests as they are arriving and hungry! These look unbelievable! Like bread and my favorite artichoke dip all in one! 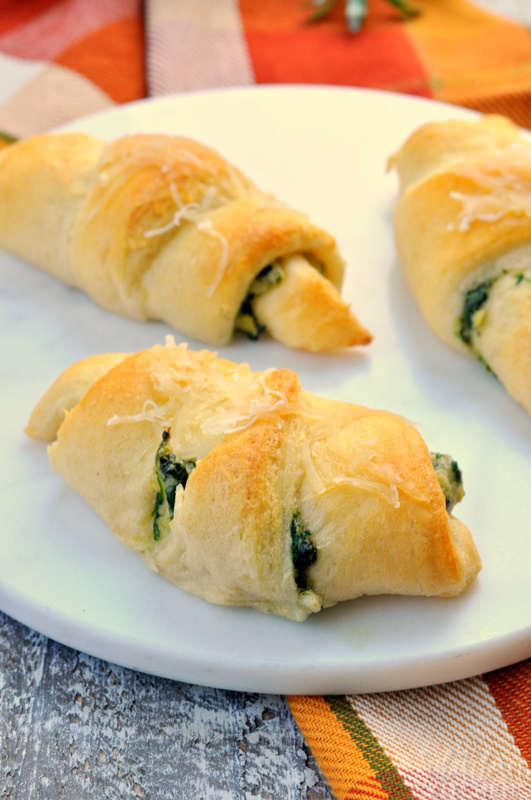 Bread + spinach and artichokes? YES PLEASE! I love spinach and artichoke together! I love these delicious rolls, great for breakfast! This will be the perfect side for dinners!